The Samadhi Retreat is a one bedroom, two storey cottage which is ideal for a romantic getaway, thus, we refer to it as our “honeymoon” retreat. Intimate, yet spacious for a couple, Samadhi’s interior is immaculately furnished, its décor chic and modern. The main floor features a compact kitchen with dining table, bathroom with rain shower and living space with a flat screen television and DVD player. The timber staircase winds upwards towards Samadhi’s ocean-view bedroom. Drift off to sleep by the sounds of the sea after a romantic outdoor Balinese bath under the moonlight. Experiencing the stunning private beach front deck and entertaining area or allow the warm jet streams of the jacuzzi to soothe overextended minds and muscles. 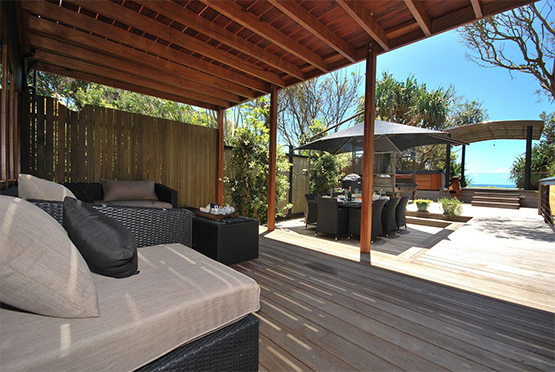 Spend your morning with someone special relaxing on the daybed or basking in the sun. Samadhi’s charms however are not simply befitting for couples exclusively. With an outdoor dining table that seats six, why not invite friends old or new around for an outdoor barbeque? For one to attain an elevated level of consciousness that is Samadhi, years of practice and study is required. Why not fast track your journey at Shambhala @ Byron? Samadhi is truly paradise on earth. “When we feel love and kindness toward others, it not only makes others feel loved and cared for, but it helps us also to develop inner happiness and peace.” Dalai Lama.